This post is part of our special coverage of the London 2012 Olympics . 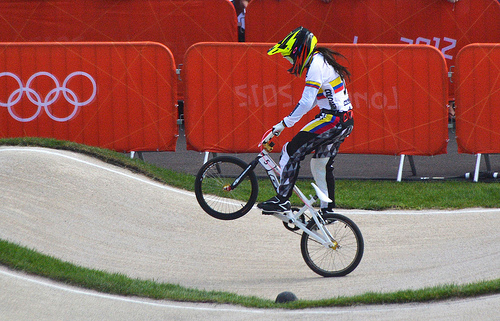 Colombia showed real excitement with respect to the last two medals that were won in the BMX  (Bicycle motocross) competition by Mariana Pajón, who won the second gold medal  in Colombia's Olympic history, and Carlos Oquendo, who won the bronze. With these two achievements, Colombia totaled eight medals in the London 2012 games. The blogosphere has also been actively following these olympic triumphs. While the blog Mundo Deportivo highlighted  [es] the two medals, the blog Deporte stressed  [es] the fact that Mariana Pajón's medal is the second gold medal in Colombia's history in the Olympics. One gold, three silver, four bronze, and fourteen Olympic diplomas, in addition to the 104 athletes competing in the Olympic Games (largest delegation in history) confirm that London 2012 had the best Colombian participation in the history of the Olympic Games.